September 20, 2014. At our game on this beautiful Saturday Jeff Kiscska, President of the Business, Industrial and Professional Association of Palmer Township presented the Miracle League of Northampton County with a check for $5,000. 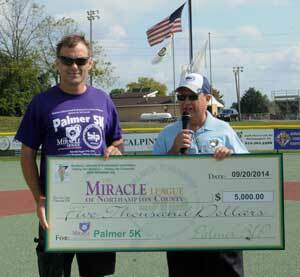 This donation is from the Palmer 5K race which was held as part of this years Palmer Community Days. We thank the BIP and the runners who participated in the race for this generous donation. The BIP has been a very generous donor to the league since the beginning.